Not every homeowner needs a workshop full of professional tools, but there are a few basics you should have if you plan to do routine maintenance and some do-it-yourself projects. It won’t completely replace your trusty old drill and screwdrivers, but a cordless driver with a complete set of bits is a must-have for any homeowner. You can get a small one for light jobs like putting up window blinds or hanging pictures, or a high-powered one if you have bigger jobs to do. A set of long-handled adjustable pliers will come in handy for a variety of jobs, from tightening nuts to providing leverage in tight spaces. Everyone needs a basic slip-joint model and a wide-mouth model for working on pipes. 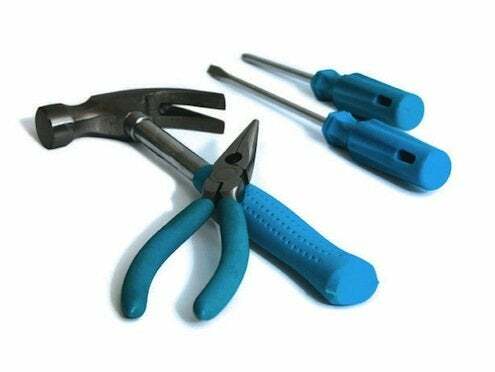 You can fill in your collection with other specialty pliers as you need them, for stripping wires, pinching off nails, or working with metal. And of course, you need a hammer or two – a curved claw hammer for general use and a rubber mallet for jobs that need the force of a hammer without the damage that can be inflicted by its hard head. Use a hammer to drive and remove nails; use the mallet for jobs like tapping pieces into place as you’re assembling furniture.